Fried rice, or cha-han (チャーハン) as it's called in Japan (a word imported from Chinese), is one of my comfort foods. (It's also called yakimeshi 焼き飯, depending on where you grew up and so on.) There are variations of fried rice throughout Asia, and a light colored, Cantonese-influenced version (probably introduced by Chinese immigrants who settled around the port cities of Yokohama and Kobe) is a standby of Japanese home cooking. It's a very frugal dish, since it's quick to make and is a great way to use up leftover vegetables and meat. My idea of perfect fried rice has to have separate grains, each coated with a bit of oil and flavoring - but never too greasy, enhanced by bits of vegetables and/or meat or shrimp and fluffy yellow egg throughout. Fried rice is best made in a red hot wok on a strong gas flame, but I haven't been able to do that for a while unless I'm visiting someone else's kitchen. Gas cooking ranges are almost unheard of in Swiss home kitchens, so I've had to use a ceramic top electric range for years. Woks really do not work on electric cooking ranges. (I don't even consider those standalone plug-in electric woks - what's the point of a wok you can't move around anyway? Besides, they take up an awful lot of space to store.) I am hoping to install a gas range, or at least a mixed-heat source range, in the kitchen that should eventually get built here in this new old house, but at the moment I am stuck with that lousy hotplate that I keep complaining about. It's still possible to make great fried rice with a weak heat source and no wok though. The procedure for making fried rice with a frying pan at home differs quite a bit from the "proper" method using a wok. Once you master it though, you can make fried rice anywhere - even on a hotplate. The instructions here are geared towards people with electric and/or weak cooking heat sources. If you have a gas range, you can still use these instructions by using medium to medium-high heat. You'll have a bit of extra time to work, which may be easier if you're not used to making fried rice or if you don't have a wok. Before you start cooking fried rice, you need to have everything ready to go. First, the aromatic vegetables - the vegetables that add lots of flavor and umami to your food. Here I have kept it simple and just used green onion (about 1 stalk), chopped up. You could also use regular onion, a little fresh ginger and/or chopped garlic. If you want spicy fried rice, use a little chopped hot red chili pepper, or dried chili pepper flakes or powder. Next are the non-aromatic vegetables. I like to add at least a cup's worth per 1- 1 1/2 cups of cooked rice. You can use any vegetables you like that are not too watery. Here I have used sweet bell pepper and zucchini. I also use some chopped precooked meat, which adds to the flavor - about 1/2 a cup's worth per 1 to 1 1/2 cups of rice. Roast pork is nice, as are tiny whole shrimps or chopped shrimp, chicken, turkey - anything you have. I've used some leftover roast ham here. Eggs are a must-have in fried rice for me. 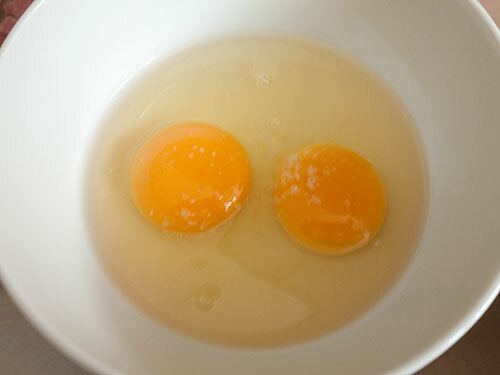 Two medium or small eggs or 1 large to extra-large egg is enough. Beat it lightly with a pinch of salt added. You'll need some precooked rice of course. 1 to 1.5 cups will serve 1 person (or 2 people with small appetites) as the main dish of a meal. 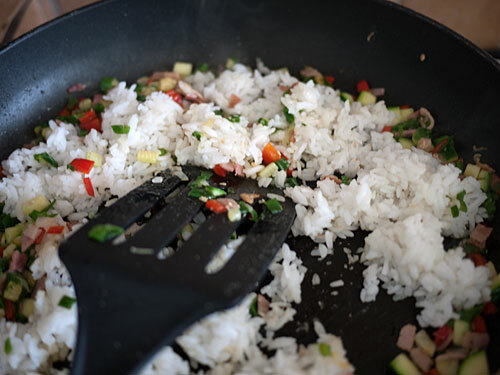 Leftover plain rice is great for fried rice, but make sure it's hot or at least warm, not ice cold straight out of the fridge, which will cool down the pan and make the rice go greasy. The easiest way to warm it up is to pop it in the microwave for a minute or two. 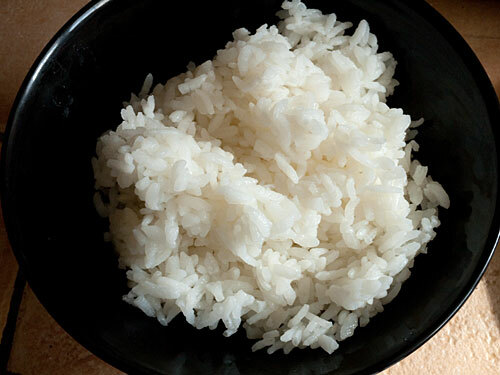 If you don't have a microwave, pour some boiling water over the rice and then drain it off very well before using. Japanese rice (which I always seem to have some leftovers of, stashed in the freezer) does tend to clump up a bit, but is fine for fried rice. Chinese takeout rice is great for making fried rice from. If you are cooking rice fresh expressly for the purpose of making fried rice, use a little less water than you might normally do, to have cooked through but firm and separate grains. Finally, some seasonings and things: oil for cooking, salt, pepper and soy sauce. You could add other things here but let's keep it simple. Once all the components are ready, it's time to start cooking. The cooking will go quite fast! Heat up the large frying pan - over high heat if you are using an electric heat source, medium to medium-high if you're using gas. (If you have a very high heat output induction cooker, adjust the heat accordingly; the food should cook fast but not burn as soon as you add it to the pan!) Spread a little bit of oil on the bottom of the pan. 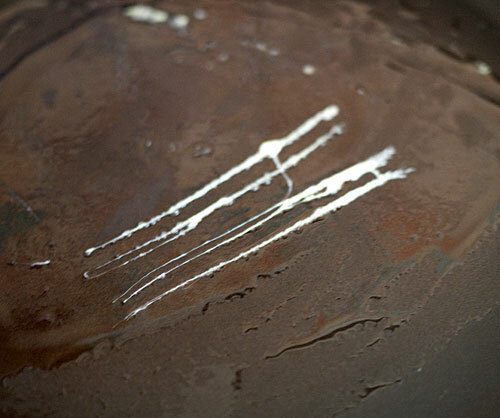 The pan is hot enough when you drizzle a little bit of the beaten egg in it and it cooks right away, like this. 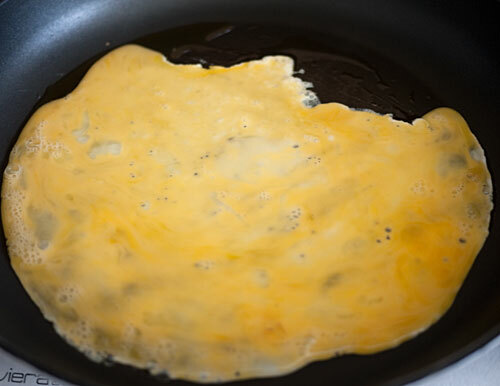 Pour in the beaten egg and spread it around the bottom of the pan, as if you were making an omelette. 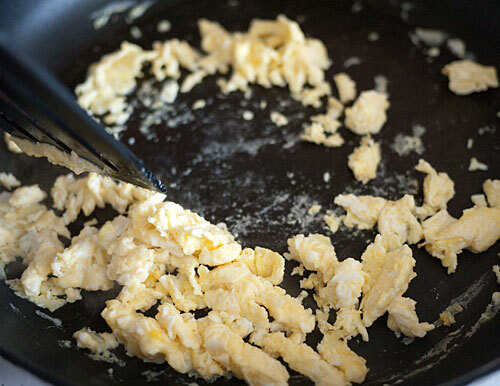 Break up the egg rapidly to make scrambled eggs. When the eggs are nearly set but a bit runny, take them out of the pan, clean off the pan if needed with the end of your spatula or a wadded up paper towel, and add a little fresh oil. 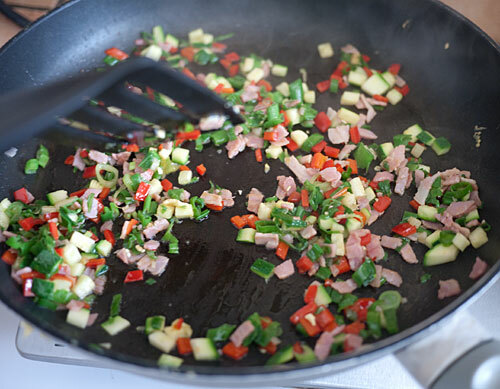 Put the pan back on the heat and add the non-aromatic vegetables and cut up meat. Let cook for a couple of minutes, stirring gently. You do not need to toss it around in the air as you see professional chefs doing on TV - they have much stronger cooking heat than you do. Let your punier heat source work for you. 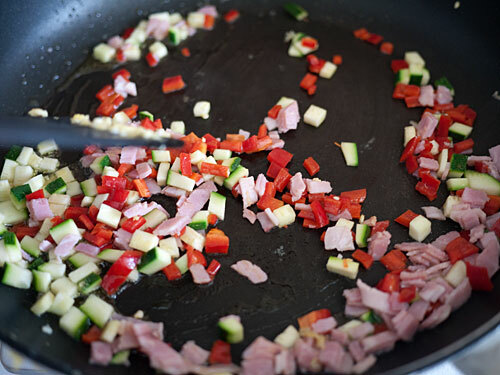 Add the green onion and/or other aromatic vegetables you're using. Stir around a couple more minutes, using the whole surface of the pan. Season with a sprinkle of salt and pepper. It should smell very good now. Re-add the scrambled egg and stir. Clear a space on the bottom of the pan. Pour the soy sauce directly on that hot spot on the pan - it will sizzle. Immediately mix the soy sauce into the rice. This method ensures that the soy sauce flavor gets distributed more evenly instead of getting absorbed by the rice grains in one spot, and also adds a bit of toasty flavor to the whole thing. The most important rule: Do not overcrowd the pan! That is the sure way to make sticky, greasy fried rice. For a large 11 to 12 inch (28-30cm) frying pan 3 cups of rice worth of fried rice is probably the maximum you can do successfully at one time. 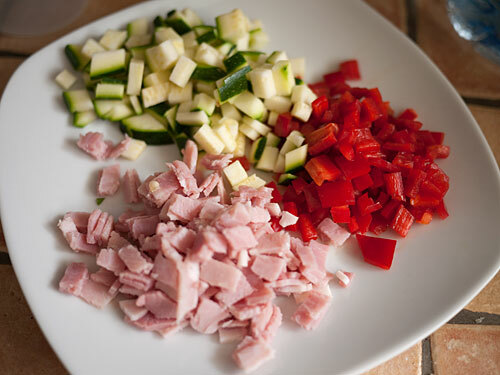 Have everything cut up and ready to go before you start cooking. Warm up the rice before using it. Don't use ice cold rice. If using an electric heat source, use the highest setting you can achieve. If using gas, use medium-high heat. Make sure your frying pan is hot, and that you use the entire bottom surface of the pan. Cook the eggs first, then take them out of the pan, to have soft eggs rather than hard little egg-bullets. Cook the vegetables and meat/shrimp through and season before adding the rice. 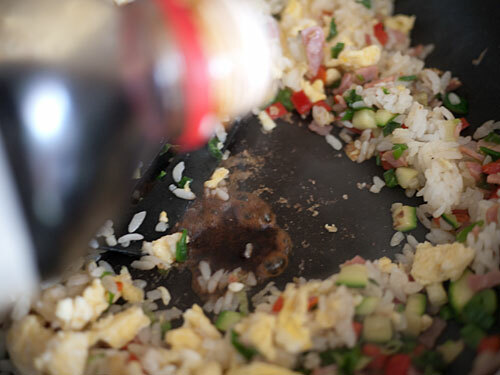 If the rice gets a bit stuck to the pan, just scrape it off; adding more oil to the rice will make it greasy. "Sizzle" the soy sauce on the bare surface of the frying pan, rather than pouring soy sauce onto the rice. Use about 2 tablespoons of finely chopped fresh ginger instead of the green onion. Finely slice 2-3 cloves of garlic, and fry them until soft. Remove the garlic and cook the rice in the garlic-scented oil. Add the garlic back at the end. Use finely chopped white onion and sauté it in butter instead of oil. Omit the soy sauce and just season with salt and pepper. Add some grated Parmesan cheese and dry oregano at the end. Precooked, finely diced bamboo shoots, water chestnuts or lotus root (renkon) are great crunchy additions to fried rice. Diced shiitake mushrooms add plenty of flavor - sauté them well before adding the rice. Finely chopped kimchi is an interesting, spicy addition. A very Japanese addition is natto. The sliminess dissipates when it's stir fried. Near the end of the cooking process, add a handful of dried bonito flakes (katsuobushi). Use tiny dried shrimp (hoshi ebi 干しえび　or sakura ebi 桜えび）instead of or in addition to meat or shrimp. A number of people sent me the link to this video of a Tokyo Gas commercial featuring a mother making bentos. It's a very heartwarming commercial (okay...maybe rather manipulative). It's part of a series of commercials by Tokyo Gas, which is a public utility as you might have guessed, emphasizing the importance of food and cooking have in bringing families together. My favorite in the series is probably this one, which is about a daughter reminiscing about the fried rice her father used to make for her. Her father only made his daughter fried rice when his wife (her mother) was away - in the hospital, or if she'd had a fight with her husband and gone back to her parents' home for a while. Every time he would ask his daughter "Does it taste good?" The daughter would never be able to reply properly - until the very last time, when she asks her father to make some fried rice shortly before her wedding, when presumably she will be leaving the family home to set up her own household. It reminded me of the very few times my father cooked for us when we were growing up. I can barely count the number of times he stood in the kitchen; typical of men of his generation, he regarded cooking as woman's work, though he loved to eat. One of those very few times was when my mother was in the hospital to give birth to my youngest sister. My father made some fried rice for my other sister and me. It was way too salty, but I ate as much as I could stand to just because of the sheer novelty of having something cooked by my father. Submitted by maki on 2010-10-07 13:45. I have been searching for a recipe just like this for quite a while. I miss my gas stove and needed proper instructions for an electric stove. Plus, this particular recipe has my favorite combo of ingredients in it. I'll be cooking it here very soon and will give you credit on my site. :) Thank you! I found the fried rice ad here, with subtitles. I think I'll make this tonight - thanks! And thank you for the sweet story about your father. I've tried making fried rice (in a frying pan) several times & have never been able to get it right (Inspired by the tons of fried rice eaten in the Taiwan drama Rolling Love). I'm so excited to try this! I know what we're having for dinner tonight!! Thank you for posting this recipe! I'm pretty stuck on the idea of using leftover rice, but using less water makes a lot of sense, so it's not too fluffy. I'll remember it for the next time I want to make fried rice, and there's nothing left over in the fridge! We make a lot of fried rice around here, but I definitely still learned a few key things from this post that should make them better in the future. I usually add my rice cold or room-temperature, for one, and I bet warming it beforehand would help. The other thing is putting soy sauce on the bottom of the pan to help distribute it, what a great idea! Aaand, I'm crying... at a commercial... in a language I don't understand. If only I had some cha-han for crying while eating. Maki, thank you for this post! Fried rice is my ultimate comfort food! It's the perfect combination of protein/veggie/carbs in one dish. I learned to cook it from my grandma, who liked a little crispiness to the rice and actually never added soy sauce but just a pinch of salt. One thing I've figured out over the years is to be careful not to break the individual rice grains when separating the clumps of rice, otherwise the whole dish gets sticky. Just watched the youtube ad, and sure enough it made me tear up. What beautiful sentiment! I love this post, fried rice has always been my best friend on lonely nights being a student. Its my favorite comfort food and i agree eggs are a must in it. 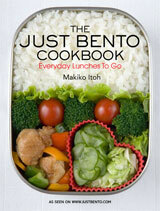 Thank you for the youtube video it made me tear up and remember the times my mom made me Obento's for saterday school. At some point learning Japanese was not the thing i looked forward to at the end of the week but the bento that would be in my backpack on saterday morning. My dad occasional cooked for me and my sister. My mom started working in the weekends and he would usually come home with fresh vegetables and fish from the market. He cooked great except for this one big miss when he thought warming up tomatoes filled with yoghurt would be a tastefull idea.. I still recall the taste. I've only been following your blog since a few months but your posts inspire me to try out more Japanese cuisine in my daily life and I want to thank you for that. I love fried rice and this version looks totally delicious...! I have been reading and following your site for some time, even before I own my own blog. I think your site is very informative. Keep up the good job Maki...:)!! Lovely, I can imagine the taste of fried rice just looking at your first picture. Regarding the egg, what would you think of frying it last in order to avoid it being turning into the "hard little egg bullets"? I am of Chinese ethnic origin and when I first made this my mum suggested I make a kind of a well in the fried rice and ingredients so that the egg may be fried in the middle, and then gently incorporated into the surrounding rice. This would save you having to take out the egg and put it back again. I used to do it like that, but I like my egg to look bright yellow, and by the time everything else has been cooked in the pan it has little bits of stuff on its surface, and the egg picks up all of it. - so I prefer to cook the egg first and take it out. Thank you for this recipe i will defiantly be trying this as I love fried rice but struggle on an electric cooker. 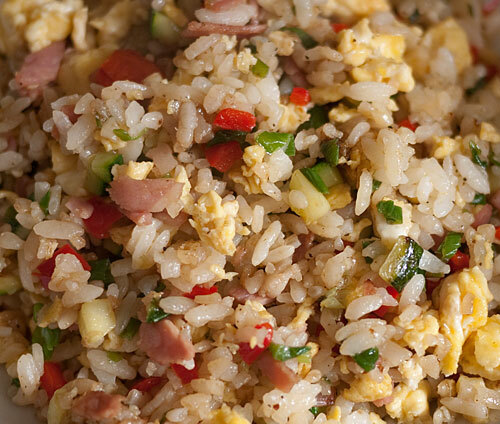 Great recipe, I always have a problem with greasy fried rice, who wants to eat that! I will try with your methods and I'm sure it will turn out great! Those commercials were very well done, almost had me crying at my desk at work! Pretty powerful message to be able to apply cross-culturally! Love all the pictures in this recipe! Great tips for fried rice thought. I always wondered why it was so simple yet delicious in restaurant and so plain when I tried it at home. Now I'm gonna try again. Wow. I was thinking about the best yakimeshi I ever ate just last week. It was in a Benihana restaurant in Miami, over a hot grill. Here in Brazil we use gas flame and as you, yakimeshi is a confort food for me(and sometimes lazy food). I will make my next one with your recipe - never thought about separate the non-aromatic vegetable and the aromatic ones. Thank you for you blog. My "obatian" is 95 years old today and I lost years of information because of the language barrier and maybe one day I will be cooking for her as she used to do for me. 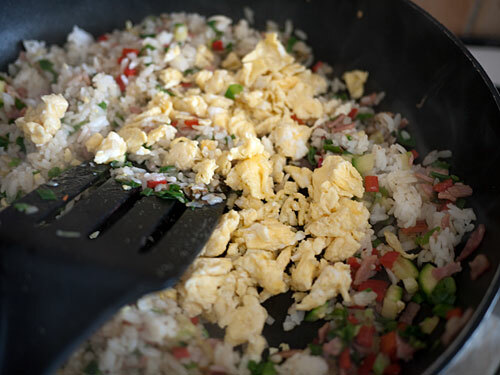 I remember making fried rice almost every night in college in a frying pan...pretty soon, we had a nightly crowd of hungry students, all looking for a bite. I've never been able to perfect this dish but this is some really helpful info. I'll give it another try. Thanks for sharing this with us. Did it for lunch, was very tasty! Thank you for the recipe! My Dad used to make porridge, scrambled eggs, and popcorn. Not together, they were just all the things he knew how to make. My mother died when I was four and poor old Dad was a bit stretched when it came to feeding me. We had housekeepers on and off until he remarried, but there were times when it was just me and him and his three dishes! I still think of him each time I eat scrambled eggs or popcorn. 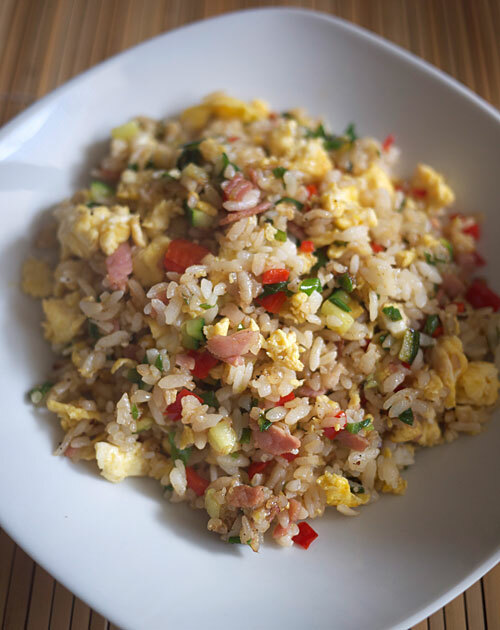 Great post and I agree that simple fried rice is always good and is like comfort food for me. Your break down of steps makes it easy to follow. That commercial got me all choked up. What a sweet Dad! Thanks Maki! It got me to try my hand again at fried rice at home today. I have gas and a wok, but have always thought you could only use cold rice. I see my problem was I was always overcrowding the wok -- I tried it twice with rice fresh from my rice cooker today and it came out perfect both times! I did try making it in a wok once...it was the worst thing ever. LOL I guess I didn't know what to do with a wok. Thank you so much! I just made this at it is delish! Everytime I have made fried rice with other recipes it just tastes like soy sauce. This recipe is wonderful! Thank you again! yum... fried rice. a staple at my house. slight difference is that i add a crushed garlic clove & a slice of ginger to the mix - it gives everything a bit of added flavor. interestingly enough, my father is the better cook. my mom cooks more often because she usually gets home earlier than my dad, but he enjoys the everyday cooking much more than she does. Thank you! I'm always afraid to turn up the heat and end up with just a different colored rice. Haha. What is the mixture the dad is pouring into the pan in the video? I was taught to make yakimeshi when I lived in Kyushu, and was told it was very important to use leftover (even day-old) rice. So when I want yakimeshi, I always make a double batch of rice the day before, and set half aside. I don't know why the leftover rice works better, but I suspect it's like using stale bread instead of fresh in some recipes. I think you were taught that old rice is better because it's dried out a bit on the surface and so is not as sticky as newly cooked rice. But with the method here you can use freshly cooked rice too, as long as you don't overcrowd the pan! Oh man, I was just thinking about fried rice all week! lol Now I can make some at home instead of going out to get some. My dad also rarely cooks, but he's the best cook I know. He can even make very bland things (like Pheasant) taste like the best thing ever! This indeed was the perfect fried rice. Although fried rice is our "go-to" dish when we don't know how to cook, this recipe just topped it off. Can't wait to impress boyfriend with it! Btw. I used leftover japanese rice from an Oyakidon pig-out a few days ago, and it worked really nice. I just needed more soysauce.. but that could just be me trying to find a way to eat even more soysauce. Yumm! Thanks for the recipe, it's already on it's way to become a staple in my kitchen. thanks for sharing this post-my comment is late but it made me think of my dad as well. my dad used to be a cook in his younger days before getting married and like all asians men thinks cooking is a woman's duty but he will cook from times to times..very rarely and his speciality is fried noodles..no one can compare to my dad's fried noodles! yo! i also do fried rice like you and thanks for the heat tip. i have a wok but now i have only a hotplate so no way to use the wok..it makes a difference to use an old good wok..
Just made fried rice with paper-thin carrot slices, thinly sliced celery, one large garlic clove minced, some ground beef and lots of teriyaki sauce. Stupendous! My two little girls dug right in! This is a great base recipe. That commercial makes me want to cry! I have tried making fried rice many times but this looks interesting i l surely try this out today for dinner. MMM I love fried rice! to keep the seasoning light I mix a bit of sesame oil, spoon of shoyu, spoon of mirin to stir in, and then season with salt and pepper to taste -- much better than "red" shoyu-soaked rice! Now this is the best recipe I have seen so far. You explained me each and every small steps. Thanks. This is the best recipe I have seen for fried rice... Made it tonight and it was delicious! 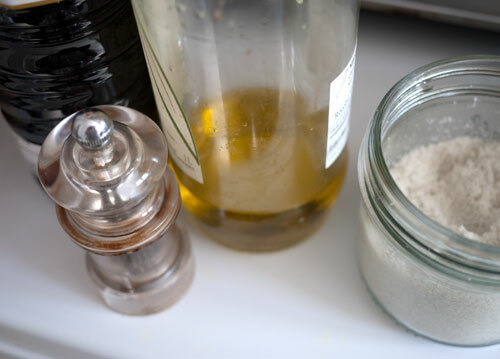 I always tens to add too much oil because I like sesame seed oil but this was helpful! I'm currently studying in London and was devastated to see an electric stove instead of the gas I'm used to at home in my kitchen... but I just made this and it was actually better than fried rice I've managed to make at home in a wok! Thank you for this! I know this is an old post, but I only recently discovered it. Just the one addition of adding the soy sauce to the pan directly instead of sprinkled over the rice has taken my fried rice to the next level. So thank you, and I love your site! I just did this recipe and I think it turned out pretty good. I used a stainless steel pan for cooking and the rice stuck to the bottom really badly, so I'm pretty sure I had the heat up too high. WIth the rice stuck in the middle, I couldn't get the soy sauce to spread at all. Other than that, it was FANTASTIC! Thank you for such a wonderful recipe. There is only a handful of really good Japanese cooking sites, and this has been my favorite since I discovered it a couple of years ago. I should have read this fried rice article a long time ago. Mine is so greasy I stopped making it. You have encouraged me to try again. Thanks! 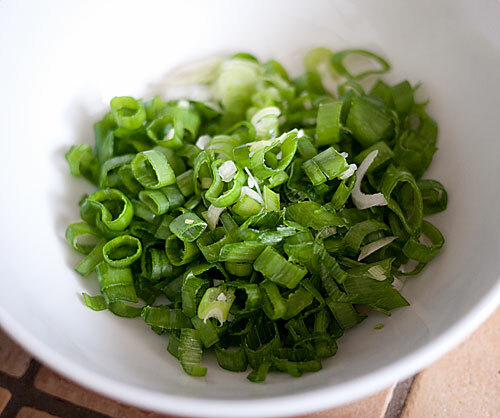 Whenever I make fried rice with green onion and have leftovers, the green onion tastes really nasty the next day. Does anyone know why this might be? What is the brand name or kind of the rice you use to make fried rice?? I used a wok but I followed everything to a T! But instead of ham I used veggie sausage links. Delicious! Thanks! Do you just use a regular non stick pan...or not non stick?? My Mom is 100% Japanese. She passed a few years back. This is almost exactly how she made fried rice. Thank you, so much. I will treasure this recipe. Duscovered your site recently, this is the first recipe I do, and it was really fantastic. Hope your health is going better! Bonne chance! This is my go-to fried rice recipe. I love it! I so appreciate the thoroughness of your recipe, you make it easy to make and it is so so good. I was just telling my husband that this is one of my comfort foods. (And please don't ever throw my extra rice out=)). Thanks Makiko!